As we get older, I think it gets more difficult for women to embark on new friendships. Just maintaining existing relationships becomes a little more work. Gone are the days when there are too many ladies nights to choose from. Husbands happen. Children happen. LIFE happens. Spontaneous get-togethers are replaced by scheduling babysitters for one night out, 6 weeks from now. I’m not saying these are bad things- each phase of life can be incredible! But it’s a slow adjustment. It’s been interesting and fun to get to know new people through the blogging world. Finding someone, who possibly lives on the other side of the country (or the other side of the world!) that you have stuff in common with is pretty cool! It’s a pleasant and unexpected side effect of this project for me, and part of why I’m loving it. One of these lovely new fellow bloggers friends is momoftwosalums. Through this crazy blogosphere, we somehow connected, and I look forward to her comments and our interactions. There is very little chance that we’d meet in every day life- she lives in New York, and I live in Park City- but here we are! Check out her fun blog. She’s got a toddler and a newborn and still finds time to post daily photos and complete monthly craft projects (and she’s got a list going in the same spirit as my Life List). We’ve challenged each other to cook a dish that has intimidated us in the past. Our designated cooking date is Friday, so stay tuned! 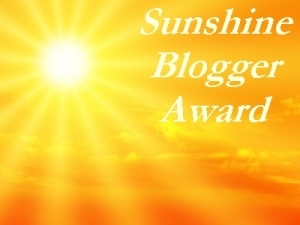 Oh, and did I mention she kindly nominated me for the Sunshine Blogger Award? (Blush.) Thank you, new friend! Answer 10 questions about yourself (see my plan for this below!). Nominate 10 other bloggers you think deserve recognition, and link to them. Share the love and link to the person who nominated you. Hunting for Bliss: Tobi has a sweet style of writing that draws me in. She writes about all of the good things that bring her ‘great joy’- we share that philosophy. Plus she’s funny. Looking for the Sweet Spot: The tagline is “In search of life’s best moments.” Aren’t we all? Paula’s another one that writes about life in a way that makes me laugh. Frozen Moments: Barbra and Jack are awesome. They cruise around Alaska in a boat. Or a camper. They make really tasty looking food while they’re at it. And they are obviously in love. Kind of perfect, eh? Trailer Trash: If you’ve been paying attention, you know that a) I love to camp and b) we have a little trailer called Betty. This couple writes about their adventures in their RV and are hilarious. Their post about the bathroom is classic. This French Farmhouse: Shanda’s life seems completely opposite of mine. And is absolutely lovely. The photos of her home, food, life really do convey a comfort and beauty that draws me in and brings me back. She also provided this recipe which prompted this cocktail adventure. The Ramblings: By far one of the funniest writers, Tori also put her wedding in the hands of her readers- and it was awesome! Check her out and laugh with me! California Pixie: Kimi is a Cali girl like me. I started there and ended up in Utah. She started in Utah and ended up there. She’s got a killer closet full of retro clothes and describes herself as a vintage butterfly. She’s crafty, and joyful, and I love reading about her life. We should be friends. Get Second Lunch: A breath of fresh air. Less words, more illustrations. A tweaked sense of humor (like mine). I always laugh out loud. je vais ou? : No, I don’t know what that means. This blog is brand new to me. But I read the post that was featured today on Freshly Pressed and was interested. I saw this recipe and printed it. The more I read, the more I liked. Anna knows how to write and her topics interest me. Like the last blog, many of these were featured on Freshly Pressed. They probably don’t need more traffic the way a newbie blogger might, but they are entertaining and bring ME sunshine. Check them out! The last request for this award is to answer 10 questions. I had a hard time coming up with anything interesting to ask myself, so I’ll toss it back to all of YOU. Comment with a question or two you’d like me to answer- hopefully they’ll create a NOT-TO-BE-MISSED follow-up post next week! Next postSweet pea and a soggy ball. Congrats on being awarded a SUNSHINE. I’ve been enjoying following, and finding, the Usual Bliss from your life. Always nice to hear your perspective and what you say today is so true. Life does happen, but it’s nice to find connections and like-minded people across the world and among the wired (wireless?) world. Great to know we are still alike in our own ways. Thanks! I love these little awards, though I am not sure what they mean. It’s just nice to be noticed sometimes, right? Thanks for finding me- we’re now following each other through this blogland! Cool! Thanks for following my blog. (I’m not sure what all the awards mean either). The acknowledgement is nice. It’s good to hear you are being supported, even from afar. Congratulations!!! I completely agree that you are a sunshine and this is a well deserved award. Thanks for including me! I’m terrible with participating though …but here’s my question for you. What was the driving force behind starting your blog? Thanks for the link, much appreciated 🙂 And glad you like my writing!! Eat chowder. You’ll feel better. Hang in there!! You is sweet! I have a really important question for you. I pretty much people this within a minute or so of meeting so I can decide if we can be friends or not. Here goes it: If your house was on fire and I was in your house (in a totally invited kind of way, creep) and also a cake was in your house (something covered in frosting), who do you save? Thank you so much for the compliment of including me! The fellow blogger awards are always so flattering! You have a wonderful blog, I enjoy visiting! Aw, thanks for including me! And.. I too would love to do a cookoff with you, such a fun idea! We’ll have to do that! I try new recipes anyway, so it’s fun to have something specific to look forward to!